Pizza Port Ocean Beach claimed a GOLD, SILVER and BRONZE medal at the 2013 Great American Beer Festival (GABF) competition. The top three winners in the competition’s 84 beer-style categories were announced October 13 at the Festival awards ceremony held at the Colorado Convention Center in Denver, Colorado. Presented by the Brewers Association, GABF is the largest national beer competition that recognizes the most outstanding beers produced in the United States. San Diego breweries took home a total of 13 different medals. in the Session Beer beer-style category for its Beer Hunter a Belgian style ale brewed in collaboration with Automatic Brewing Co for Michael Jackson, the Beer Hunter’s, birthday. and Bronze for Kung Fu Elvis in the American Strong Pale Ale category. The 2013 GABF competition winners were selected by an international panel of 201 expert judges from the record number of 4,809 entries received from 745 U.S. breweries. GABF medals are among the most coveted in the brewing world. The San Diego County Bicycle Coalition, an organization that advocates for and protects the rights of all people who ride bicycles, ends its six-month stretch of monthly neighborhood bicycle tours this Sunday, October 20, in one of San Diego’s most locally loved neighborhoods: Ocean Beach. The final Bike Local Sunday kicks off at 11 a.m. in Robb Athletic Field with bike tune-ups courtesy of OB E-Bikes and local coffee. Once folks have put air in their tires and had their cup of Joe, the leisurely neighborhood ride departs to tour some of Ocean Beach’s most unique local businesses and scenic coastal views. In partnership with the San Diego Business Improvement District Council, local businesses have hopped on board with the monthly neighborhood tours by offering special discounts for two-wheeled customers for the day, including the Lazy Hummingbird Coffee & Teahouse, Lighthouse Ice Cream & Yogurt and the Inn at Sunset Cliffs. Bike shops in each neighborhood have also been involved, leading the morning group ride, touring quaint and noteworthy streets and shops for riders to get a true taste of the businesses that make each community unique. Bike Local Sundays are for all folks to enjoy, whether their style is spandex and clip-in shoes, board shorts and flip flops or skinny jeans and heels, the events are for all to participate in everyday cycling in San Diego. For more information on Bike Local Sundays, visit www.bikelocal.com. Also visit www.sdcbc.org for more information on other local cycling events in San Diego County. A diver had to be rescued late Sunday afternoon, Oct. 13th. The woman diver had been diving off the Yukon dive site off of Mission Beach, but around 4:15 pm, she suffered from some kind of medical condition underwater and was rescued by lifeguards. A local San Diego television station is displaying a video it received from a skateboarder who recorded a confrontation he had with the principal of Loma Portal Elementary School in Point Loma. Bystanders who witnessed an elderly woman fall into Mission Bay jumped into the water and rescued her. About 10:30 am on Tuesday, Oct. 8th, a 72-year old woman fell about 4 feet out of a suspended dinghy onto the deck of a sailboat – and then she fell into the bay. The fall happened at Quivira Basin marina, in the southwest corner of Mission Bay. San Diego is approaching a critical juncture. 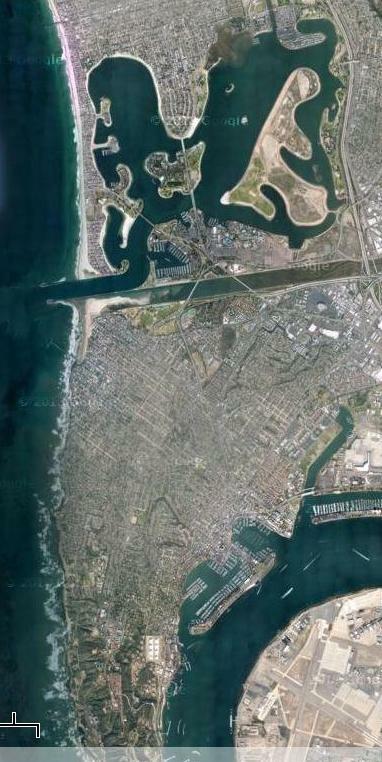 It is the only remaining California city that does not treat wastewater to secondary standards before discharging into the Pacific Ocean, and its five-year waiver – allowing the Point Loma Treatment Plant to discharge up to 240 MGD (908,400 m3/d) of advanced primary treated municipal wastewater into the ocean – is set to expire on 31 July 2015. An application for a new permit waiver takes about one year to prepare and must be submitted by January 2015. According to this schedule, the preparation process should start this coming January. However, most observers, including the California Coastal Commission and the state’s environmental community, object to the city being granted another waiver. The city’s 2012 Recycled Water Study found that direct or indirect potable water reuse could avoid the estimated $3.5 billion capital and financing cost to upgrade the treatment plant to meet secondary discharge standards while providing a competitive new water supply option. The Study outlined a concept that would divert 100 MGD (378,500 m3/d) of wastewater flow upstream of the Point Loma Plant for advanced treatment and potable reuse. San Diego has a history of having stakeholder groups fill the leadership void with regard to potable reuse. When former Mayor Jerry Sanders was unsupportive of potable reuse, environmental, business and labor groups formed the Water Reliability Coalition and successfully advocated to keep potable reuse studies and a demonstration MF/RO/UV reuse project moving forward. Now, as the city struggles without a Mayor or Public Utilities Director, the environmental community and the Metro Wastewater Joint Powers Authority – a coalition of municipalities and districts representing about 35 percent of Point Loma’s wastewater flow – have joined forces to advocate for the development of a 100 MGD regional potable reuse program to create a new local, diversified water supply and maximize the flow offloaded at Point Loma. Indications are that a water reuse scheme may produce the region’s most cost-effective water supply over the next ten years. The city must soon decide whether it will continue to remain heavily dependent on imported water, with its significantly rising costs, or fund the capital and operating costs of a new, local water supply for the region. It may be now or never. As a councilman, Kevin Faulconer has been very knowledgeable and in tune with Ocean Beach. Many of our neighborhood leaders meet with his office staff or with Faulconer on a monthly basis. This has been the case for many years, and has helped us find working relationships with others in the community and with our other political representatives. in a survey done this month in a USD public speaking classroom, only one out of the 20 students surveyed listed Ocean Beach as their favorite beach. Ocean Beach, also known as OB, is a unique community nested on the coast of San Diego. … My friends who are not from San Diego are often reluctant to go to OB, while those who are local readily accept, and tell me their own stories about the times they visited the area. … Aside from its beautiful, sun-soaked beaches, OB is home to Dog Beach and the OB Street Fair, as well as a variety of shops and restaurants. … Overall, OB has a lot to offer. The area is home to one of the famous San Diego beaches, as well as a variety of local events. This makes it a very intriguing community in San Diego County. The OB Farmers’ Market occurs every Wednesday all year long, from four p.m. to seven p.m. in the winter and to eight p.m. in the summer. During the event, Newport Avenue is closed off from oncoming traffic and the street is lined with various booths and stalls. There is fresh produce, flowers and art, as well as live music being played by local bands. Surprisingly, OB locals are not the majority of people attending this weekly event. In fact, a recent survey done at the Farmers’ Market by the Ocean Beach MainStreet Association, 55 percent of those surveyed did not live in OB. and demolition of upper rental properties for Sunset Cliffs Natural Park. The PCPB voted 8-3-1 to forward the entire list of 11 infrastructure improvement projects to the city. The Point Loma planners also heard an update on Liberty Station’s ‘surplus’ parcels. There is a planning area in the northern, flat area of the Peninsula – the Midway-area, and it has a planning group. It’s called the North Bay Community Planning Group (NBCPG), and the panel that sits on its board was presented with the City’s revised community plan for the area during their September meeting. This plan affects the Pacific Highway Corridor as well. And the plan hasn’t been updated since 1991. That’s primarily because the area is often thought of as an industrial, commercial and entertainment area. But shifting attitudes have followed changes in the neighborhoods, which include, as various sub-districts loosely defined as Sports Arena, Kemper, Dutch Flats, Camino Del Rio, Channel, Lytton, Kurtz and the Hancock transportation corridor. The Midway/Pacific Highway is comprised of the central Midway shopping area, including the former sports arena (now Valley View Casino Center) and the narrow, linear-shaped Pacific Highway Corridor. Pacific Highway Corridor between Interstate 5 and Lindbergh Field contains some of the city’s oldest industrial areas and is defined by large-scale buildings and commercial parking lots in the south, and smaller-scale industrial buildings between Witherby Street and Washington Street in the north. The Cat Coalition faces the tireless task of providing care and feeding San Diego area’s feline colonies while attempting to control a growing population. The jetty between OB and Mission Bay is home to about 50 feral cats. Some were born wild and some were abandoned, but all now call the jetty home. These are not normal feral cats, fearful of humans, hissing and darting at the sight of a sneaker. They are a managed colony, appropriately known as the Jetty Cats, with a Facebook page and an assemblage of devoted feeders, some of whom have been dropping by with Fancy Feast deliveries for upward of 30 years. Audrey Stratton, a 28-year-old Ocean Beach resident, has been feeding the colony for two years and knows every one of the residents. She’s concerned when one vanishes and aware when a new member joins. For more. To put down fewer animals, facilities want to change policies so they could release feral cats, find homes for dogs without waiting for owners. Animal shelters struggling to slow euthanasia rates are considering controversial population management approaches that include releasing fixed and vaccinated feral cats back into the wild and allowing unlicensed dogs to be immediately adopted instead of waiting days for the owner to come looking. Customers will help decide what vegan products will go on the shelves. On Nov. 7, vegan customers will join Barons Market’s first-ever, exclusive vegan food tasting to choose what goes on the shelves. Lifestyle vegan customers will join Barons management and CEO in a sampling room full of vegan foods. Together, customers and staff will weigh in on taste, packaging, selection and prices to decide products sold at Barons Market. The family-owned market stocks all-natural and organic foods. The vegan tasting is scheduled for Thursday, November 7, from 2 – 5 p.m. at Barons Market, 4001 West Point Loma Blvd. Vegans interested in attending should contact Rachel via email to request a seat. See this older post by Johnny McDonald / sdnews.com about the old railroad lines that operated between OB and La Jolla. Shipping magnate John D. Spreckels used his wealth to build … an elaborate seaside and bayside resort at Mission Beach. An area was selected in 1922 for an amusement center, dance casino, bath house with a plunge, provisions for surf bathing, concessions, a roller coaster and a miniature San Diego & Arizona Railway system. Three years later, … Belmont Park, opened. … The question of obtaining adequate transportation for larger crowds was brought to the builder’s attention. … First, a shuttle service with two old street cars was installed from the Ocean Beach line to a track from the defunct Bay Shore Railroad Company. This included a bridge across the channel that had been built in 1914. … Following the construction of the Ocean Beach substation building — with Egyptian design — a similar one was erected in Mission Beach. … With the opening of the new line to the beaches, service via the Point Loma Railroad to Voltaire Street in Ocean Beach was abandoned. That section of the line would be served by buses starting in 1938. …. The Dana on Mission Bay- you should know about our stay. My wife had to attend a conference at San Diego’s Pacific Beach and we ended up at the Dana instead of our usual haunt the Catamaran. I busted my behind to get ahead a t work so I could join her on Thursday and I figured we could have a relaxing stay of a couple of extra days as we have often done at the Catamaran. No such luck. I arrived Thursday afternoon and the charming young lady who checked me in was pleasant and efficient but it went down hill from there. My wife had two days reserved by her employer for the conference and once she saw the facility she called the desk, not once, but twice, to extend our stay at least one day, possibly two. I didn’t expect that it would be a problem as it was off season and the place wasn’t that busy. The room itself was your typical motel room with the usual amenities but a stubborn screen door that takes two men and a boy to open and close. We had a great dinner and drinks at the hotel’s restaurant and the waitress we had was attentive and very pleasant. I almost had a restful night until some idiot set off his car’s burglar alarm outside our door but I did manage to get back to sleep. I got up looking forward to spending a day or two seeing the sights at Pacific Beach without the congestion and summer crowds. I took a shower and when I pulled the towel off the rack I was greeted by a very large black widow spider. I called the desk and reported it and she assured me that it wasn’t a common occurrence and she said she would send someone right away to kill it. A half hour later no one had arrived so I folded up a newspaper and killed it. I called the desk again and told her to cancel the person who was going to take care of the vermin. I had done it myself, but I’d need fresh towels as I didn’t want to risk more of her kind invading the rest of our room or possibly taking home some of her offspring. I dried off with a hand towel from the next room and went to breakfast. I had an enjoyable brunch at the hotel restaurant and the problems escalated from there. When I tried to get back into our room my key card was dead. I went to the reception desk and no one knew anything about our extended reservation. I wasn’t lucky enough to get the same young lady I’d had the day before. This one didn’t know anything and could care less. She had the warmth of a DMV reject. She said we’d have to move to another room and it would be smaller with fewer amenities and it would cost more. My wife’s conference wasn’t scheduled to end until 1:30 and the clock was ticking so I had to make a command decision. The clerk re-magnetized my key card and I returned to our room and started packing. When I got there I called the desk and said I wanted to talk to the manager. I was packed and the car was loaded by the time anyone arrived and it wasn’t the hotel manager, it was the “Chief maintenance engineer” and a gopher who arrived to soothe my ruffled feathers. I explained what had already happened and they both agreed it was inexcusable but by that time it was obvious to me that customer service was not their strong suit and I wasn’t interested in their excuses or apologies. After my experience there, there’s no one I’m mad enough at to recommend they stay at the Dana. I noticed you have more news from Mission Beach and Mission Bay. Is this a trend? Molly, yes it is. We’re trying to expand the net of our coverage on the net. We like to say we cover the beaches, which includes Mission Beach, Mission Bay, the Midway District, Pot Loma of course, and even PB at times.